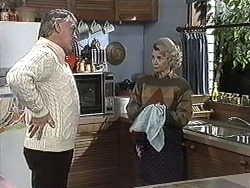 Helen has her work cut out for the message to sink into Clarrie that she doesn't want to go out to dinner with him and that its best too if they just remain neighbours. He seems quite down that he's been knocked back and calls Helen a, “very lovely woman,” and that she can't blame a bloke for trying! Kerry is sorting out the donations for the toy swap, including Mel who donated one of her pigs! Joe/Toby laugh at some of the old Robinson kids' toys! 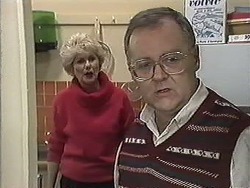 Harold isn't impressed at Madge's plan as he feels they are losing money. The customers can hear them arguing inside the kitchen including Harold tell Madge that she is ‘sacked' – he doesn't want her doing anything at all in the shop be it serving behind the counter or doing the books! Madge is annoyed at his decision and storms out! 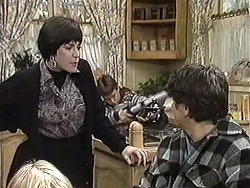 Helen comes in to complain about the promotion – why is herbal tea not being offered alongside the coffee! That is the last straw for Harold and he too storms out of the shop! Toby is happy with what he picked up in the swap as the Mangels arrive home. Kerry is happy at the ethos of the swap too. Eddie has tampered with the coffee (made it triple strength) to get rid of the freeloaders and it appears to have worked although Harold isn't too amused because they have a reputation to uphold! Annabelle calls round to collect Ryan for the party they are going to. He realises he's a bit underdressed compared to her and goes off to change. 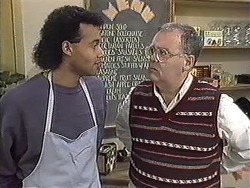 Madge is now moaning to Kerry about her dad and her suggestion is for Madge to show him his error of his ways! 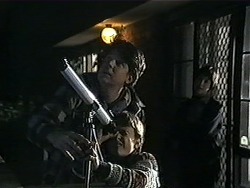 Joe has been encouraged to show Toby how to use his telescope and reluctantly heads outside with his lad. He might not know much about astronomy but he knows how to tell a yarn which has Toby engaged… even if it isn't quite accurate! 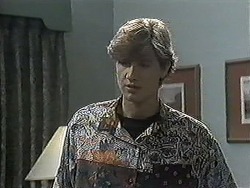 Ryan comes looking for his grandfather but Helen hasn't seen him, so thinks he's headed to the bar instead. she promises to drop in past later to check on him. 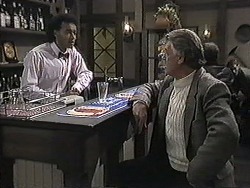 Clarrie is in the bar and receives a lecture from Eddie about drinking given his promise to Dorothy. Eddie gets it out of Clarrie why he's down in the dumps (woman trouble) and reassures him that there is life in the old dog yet! 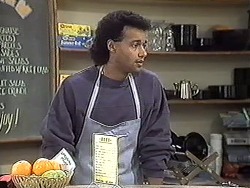 He suggests Clarrie goes home but the man wants a refill! The atmosphere at #24 is very frosty between the Bishops. Madge is after some more money from Harold but refuses to say why – it's her revenge for him not telling her about TCS accounts! Annabelle and Ryan are back from the party and she thinks it's because he didn't have money to go to the club although she would have paid. He reasons that he wanted to talk to her instead… well that and a bit of pashing! 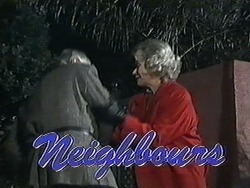 Helen arrives just as Eddie is closing up to see if Clarrie was there. He says that he's just left and she's relieved to be able to stop worrying about him. Helen finds a very drunk Clarrie singing his heart out badly… he's still got a broken heart and is contemplating drowning in the pond because Helen won't go out with him! “You are making a fool of yourself,” Helen tells him but he's not listening and goes to jump into the water as the credits come up.